Yard Waste is picked up once per week. The landfill defines "yard waste" as grass clippings and leaves only. Any garden waste, flowers, bush trimmings, pine needles, and branches should go with your trash. The scheduled day is dependent upon your neighborhood. Please call the office for details at (402) 467-1239. 1. The 45 and 50 gallon cans similar to the pictures below are no longer acceptable for yard waste disposal. As stated in the Lincoln Municipal Code 8.32, your garbage can should not exceed 32 gallons in capacity and should have 2 handles and a lid. 2. ALL branches should go with your trash service. 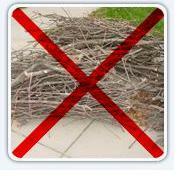 Branches must be cut down to 3-4 feet in length and bundled with rope, twine, duct tape, wire, etc. 3. 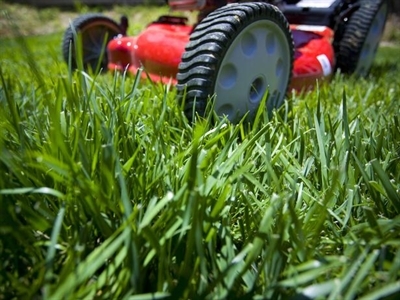 We recommend the following for yard waste disposal. Spring Season: April 1st through May 31st. Full Season: April 1st through November 30th. Fall Season: October 1st through November 30th. Between December 1st and March 31st : LARGE AMOUNTS OF YARD WASTE MAY BE SUBJECT TO AN EXTRA CHARGE.